After playing in Junior College at San Mateo and raking in an All-Golden Gate Conference choice and team MVP honors, Patrick McGuirk would play at Cal Poly (San Luis Obispo) making 42 tackles and a pick. He’d sign with the Blue Bombers of the CFL in 1990 but not make the squad. In 1991, the Raleigh-Durham Skyhawks, coached by Roman Gabriel, selected Pat in the 8th round of the league’s positional draft. Despite the team’s woeful 0-10 record, McGuirk had a banner season, with 37 tackles, 9 passes defensed, 3 fumble recoveries and tied for third in the league with 6 interceptions. He would be snubbed for All-World honors. 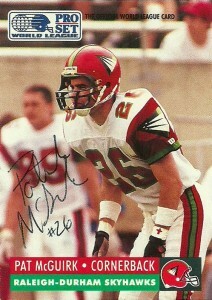 After the season, the Skyhawks were euthanized by the league, and the players were put back into the WLAF’s draft pool. The Frankfurt Galaxy selected him in the 5th round of the league draft in 1992. He’d play for them that season, but did not notch a turnover. (His Ultimate WLAF card is considered a major error card, as they note that he is a rookie, and omit his previous season’s statistics, even though he played for the Skyhawks.) The WLAF would be reorganized after the 1992 season but Patrick found new life, -in the AFL. The young Arena Football League was the perfect landing spot for Patrick. In 1994 he’d sign with the Fort Worth Calvary, crushing ball carriers with 54 tackles, 21 pass blocks, 2 forced fumbles and 5 interceptions. Patrick quickly moved back to his home area in 1995 signing with the San Fransisco 49ers and was assigned to their practice squad. He’d continue playing in the Arena leagues in the interim, but this time for the San Jose Sabercats where he’d have another impact season with 9 picks for 202 yards and a td. Pat’s followup 1996 season would culminate with 7 picks and 15 pass breakups which earned him first team All Arena honors, and earned him another shot to play on the roster of the 49ers and their practice squad. After the 1998 season, McGuirk would retire from football. He’d finish his career in the Arena leagues with 5 seasons under his belt, 258 tackles, 81 pass blocks, 3 forced fumbles, 29 interceptions for 317 yards and a touchdown. He didn’t have far to go, as he retired to the San Fransisco area where he was born and currently works in the telecommunications industry. Finally got another Facebook response. I started off really hot with contacting players through Facebook and getting their permission to send to TTM to their address (Howard Feggins, Corris Ervin, and Jon Horton,) and then just went stone cold. I shot out an email to Patrick in July since he is of the elusive Raleigh-Durham Skyhawk family, that I am woefully short of autographs from, -as they only lasted one season. In late August he got back with me and gave me his address, so I quickly turned around and sent him two cards to sign and a few to keep as momentos. He kindly responded in 10 days. A real nice return on a hard to find team.